Love all your green and white pumpkins ... my favorites! Thanks, Webb! It's been a great season for interesting squashes! What a nightmare story. I can't believe they wouldn't accept your expired license. But better to be told by a geek than a police officer. You're quite the trendsetter. Whole Foods has George Washington Carver bouquets of cotton. 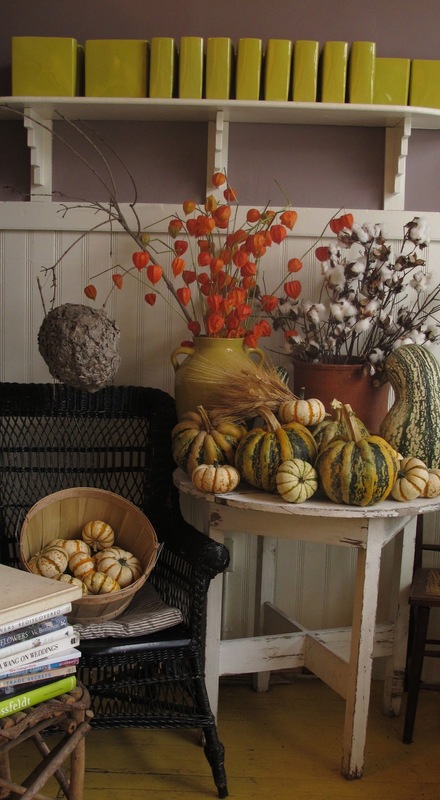 Your fall display is awesome. Maybe you should get a nice relaxing massage? That is an amazing story of salespeople going way beyond the call of duty. Maybe he can come down here and work at Homeland next..
What a story--we are turning into a friggin' police state. Glad you like the 4s--it was only a year ago that it was the new thing! Your store looks so pretty. Say hi to Opal. Hopefully you don't have to take the driving test, I couldn't pass paralell parking if they put a gun to my head. I don't get the IPhone madness, could care less. Love your pumpkin display! Oh, sugar, how damn frustrating! Still, the 4GS is grand. Oh my goodness, I can't believe the Apple guy was so vigilant, surely the id was just to prove you were you? But the 4S is brilliant, and a bargain.